A long weekend of ‘giving it large’ (or whatever it is you young people call it) in Ibiza, my favourite island in the Balearics (ooh, Matron…), meant I was still able to curl up on the sofa and watch the game, nursing an extended hangover. The first half did nothing to improve my thick head and shrinking liver, and then came Romelu Lukaku. And Idrissa Gana Gueye. Oh yeh, and Bolasie. And Deulofeu. And Gareth Barry. A second half transformation second only to St Paul on the road to Damascus, and the boys responsible for sticking the ball in the onion bag finally came through, building on the extraordinarily tight and solid back four, in which I thought Williams was immense. A smiling Rom is a lovely Rom, and he usually smiles when we win, always smiles when he scores, so long may we see those pearly-white chompers staring us down at us. This is the man that many describe as lazy. This is the man that is one of only 5 players to have scored 50 goals in the Premier League before his 23rd Birthday; he’s scored nearly 100 Senior Goals. And he wants to play Champion’s League football. Some castigate him for that too. I’m a realist, and I know that players want to leave the Club I love to hopefully better themselves. Some achieve that (Rooney, Gravesen, Lineker to name but three), although most don’t (Lescott, Rodwell, Gosling just three of a much longer list), for whatever reason. Football players are transient beings, commercially-minded (a minority), commercially-misled (the vast majority) who can be dropped by their ‘boyhood club’ when they’re not ready to step up at 18, or who can be released at the other end of their careers sometimes without ceremony. Loyalty is a fickle thing at the best of times, and if someone offered you double or even triple your wages and maybe live in a City with brighter lights or better weather or both, plus the prospect of playing at the highest level in your chosen profession, especially if by common consent your profession drops you like a stone in your mid 30s, then maybe you’d think twice, but you wouldn’t take long to do it. So let’s be careful about giving Lukaku stick, and just revel in the fact that we’ve got one of the best strikers in the PL, if not in Europe, playing for Everton. And again, he’s only 23, so by his own admission, he’s still got lots to learn and lots to improve upon, whilst banging in the goals for us! Lazy? Nah, not sure about that either. He doesn’t run around as much as Andy Johnson, or Denis Straquarlursi, but he’s a better striker. Does he move in to space enough, and make himself available more? Might be an area he needs to improve as I mentioned earlier, but lazy? No. Not for me. And I always worry about the sub-text and stereotyping that sometimes is associated with people calling black players lazy. Not that anyone would ever call my joint MotM lazy. Step forward Idrissa Gana Gueye. And ‘step forward’ is what he does a lot of. 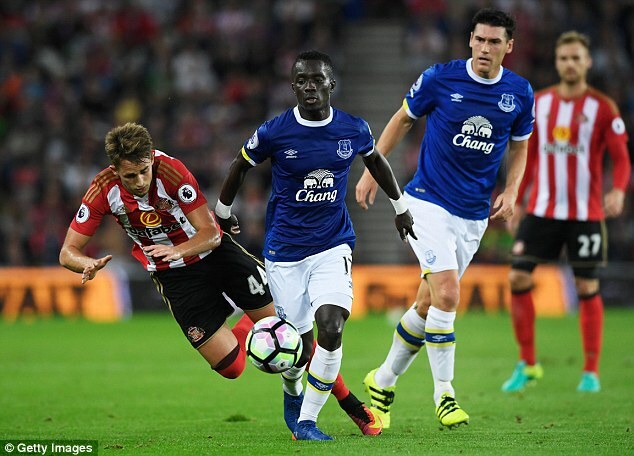 I’ve said before that Gueye won’t get many people heaping lavish praise on him because he never scores, he occasionally assists, but it’s the nature of his Makelele-was-better-than-Kante-type role that often doesn’t get noticed, but is critical to the solidity of this Everton team after playing just 4 games against opposition with quite a lot of limitations, and I suspect will be for the rest of the year. (Hands up who hope Senegal have a meltdown and get knocked out of the ACoN early? And add DRCongo to that list too.) But to get heaped in praise by Carragher and Neville on MNF shows the lad is getting noticed, big style, and not just by Blues, or his fellow players, so expect him to be linked with Real Madrid any time soon. Until maybe such a thing actually happens, as with Rom, let’s glory in one of the best players I’ve seen in Blue for many a year. 96% pass completion rate, and his sloppiness (!!) at giving the ball away 4 times out of 106 attempts only came when the game was won and he tried longer raking passes out wide; 2nd most tackles, only beaten, curiously, by Barry; 3rd most km covered – well who the hell covered more (I’m assuming the stats don’t include Moyes who spent a lot of time up and down from the bench)? ; but how do we measure his work ethic, his ‘bothering’ of opposition players like a lazy drunken wasp at a September picnic, and his all round covering and support for those around him. He was immense on Monday, and at £7m, as everyone has said, he’s my buy of the season for the whole PL. I could go on – an on – about what happened on Monday night. But let’s not forget we had a first half to mourn not celebrate, so let’s not get over excited just yet, and of course, sadly, it was ‘only Sunderland’. But let’s be joyful that Barry continues to confound his moaning critics; that in Bolasie we’ve got someone who, yes, cost a lot, but looks the real deal after a dodgy first 20 minutes; that Geri made a significant contribution when he appeared after half time; that we have a manager that is prepared to act quickly and decisively (and ruthlessly, with no respecter of reputations) to change things when they’re not going well; that we won without Mirallas catching fire but for one delicious assist; that in Jags we still have a leader in deed, and in Williams we have a co-leader in deed, and out on his own in vocal direction, and I could, as I said, go on. Middlesbrough will bring different challenges, but if we can replicate our second half performance ideally for most of the 90 minutes we won’t have a problem.